NOTE: Limited Stock available, Clearance price. Replacement model is PMC-5151/5231 or PMD series. The PMC-5141 offers a simple method of reading and storing data from up to 16 of the PM series Power Meters (via RS485). The data can be saved in CSV format, then sent to a back-end FTP Server or SCADA software for further data integration or analysis. 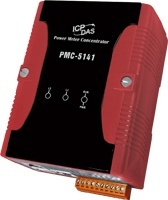 PMC-5141 also provides power demand management and alarm notification functions. By utilising the compatible I/O modules (e.g. XW107), dependant on a set power demand level, it is possible to turn on/off devices, offering further power management possibilities. In addition, PMC-5141 has a built-in Web Server, which allows users to connect to PMC-5141 via a browser to view power data, set up parameters for the controllers or view the real-time/historical power data of the devices. By using Flash HMI Tools function, users could easily design a specific power monitor page by a few clicks on browsers. The PMC-5141 can also act as a Modbus TCP Slave, so that SCADA software or HMI devices can connect to the PMC-5141 to obtain the front-end power meter data via the Modbus TCP protocol. Now with utility software to interpret recorded data offline (after manual download or FTP upload).